But can he punch out a T Rex??!! For the Allies we’ll be using Kosta’s Dogface GI’s, filled out with some “generic” Allied troops. Don’t know about the Germans and dinoasurs yett – thats in the hands of Nic and Kosta. I’m going to be hanging out for the dinosaurs! Its always easier to write a game when you have the figures in front of you to give you inspiration. 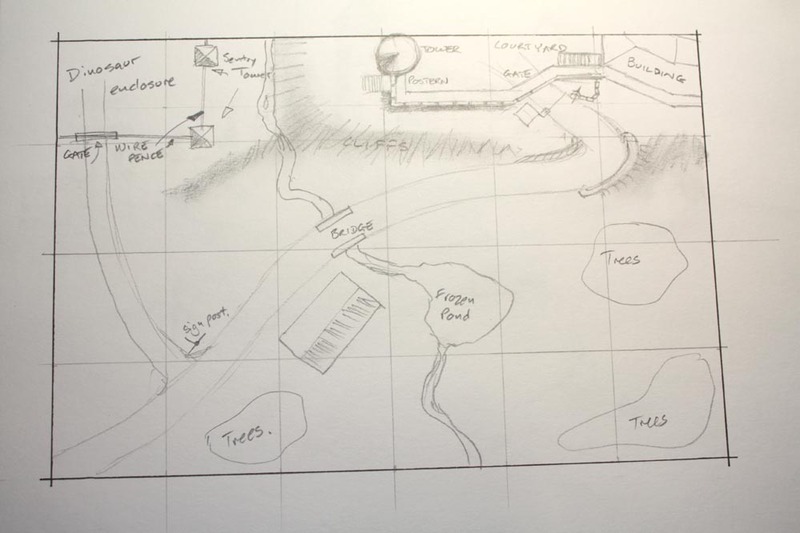 Alan's very first concept sketch for the table. Originally it was 6 feet x4 feet - it has now grown to 8x4 ! So what is the actual game on the day all about ? On the left is the very first sketch Alan did, based on a couple of emails between us. And it is still essentially how the game will look – Schloss Schwarz on the northern edge, the dinsoaur compound (or “dinolager”) beside it in the far corner . In the middle of the table are a few village buildings, which have now become army barracks. The valley is the training ground for the new, elite, Panzersaur division (we’re still having debates about that name!). In the dinolager, the dinosaurs are bred and trained up. There is a secret laboratory (of course) in the castle, where research goes on to make better, trainable, dinosaurs. The Fuehrer has decreed that a propaganda film should be made, to demonstrate to the world the new might of Germany – who now controls the most primeval of forces! To make this film they have brought in the well known film director, Otto “Dino” De Laurentis . They have also kidnapped Ginger Snaps, well known American war photographer – she is to appear in the film to give it added credibility. The Allies have three missions: 1) destroy or capture the film, before it is released to the world, 2) destroy the laboratory and dino hatchery and 3) rescue Ginger Snaps. All in a days work! The Germans, as well as preventing this, are desperate to get the film out. At this stage there will be 3 German players, and 3 Allied players – the Allies will have 3 squads coming in on the southern end of the table, on the left, centre, and right. The 3 German players will control forces in the Dinolager, castle, and valley… we’re playing around with variations on this … maybe one of the Allied squads are Soviets with their own agenda …. one of the allied squads will be paratroopers and have to be “dropped” into their target area…. The allied squads will probably be 10-15 figures each. At this stage I’m not sure about the Germans, except for dino riders – about 15-18 “on parade” in the valley… which should look nice. 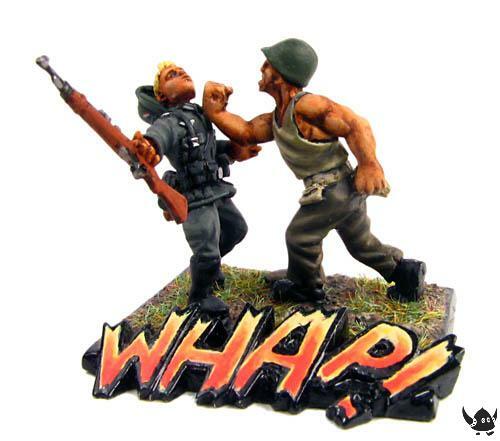 As to rules – for Little Wars I plan to keep it simple simple simple. I probably won’t use any published set of rules – though I’m highly impressed with Song of Blades and Heroes as a fast, versatile set of rules. I’d like to do two sets of rules – one for the games day, and one for home use, which would be a more detailed. You are currently browsing the archives for the Scenario category. Spodding Alan Harrison’s terrain blog. See the table for Jurassic Reich!